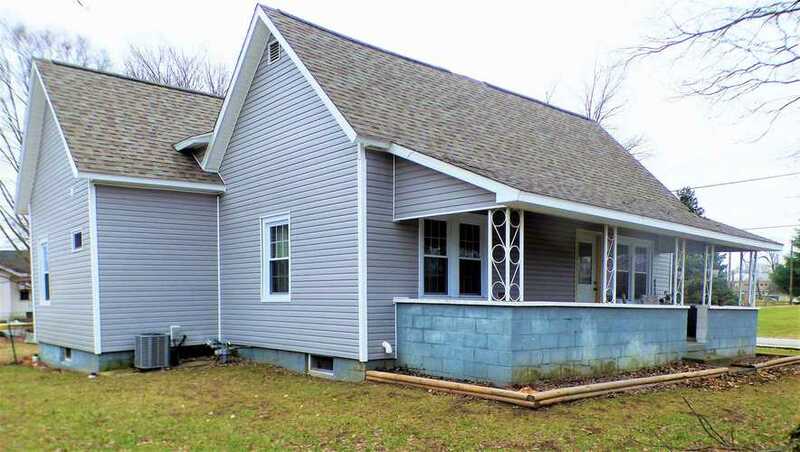 NEW SIDING, ROOF AND WINDOWS, this 2 BR home is a great starter, downsizer or rental income choice. Refinished wood floors, new laminate in kitchen and completely remodeled bath. New front door, newer water heater and HVAC system. Appliances stay. No water bills as this one has its own well. Home has extra insulation in attic and back porch filled in for a bonus room that you can finish the way you want. Detached 2-car garage and fenced yard. Extra siding for garage included. Directions:Fron Hwy. 57 going north through Plainville, turn right on John St. Home is on the corner of Bloomfield Rd. and John St.